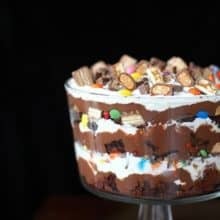 Decadent Candy Bar brownie trifle, one seriously delicious chocolate dessert! This is a great way to use up Halloween treats or a crazy decadent party trifle! Slice the entire brownie pan into thirds, one part for each layer. Make the chocolate pudding according to the package directions. Whip the three cups of whipping cream and one tbsp of white sugar in your mixer until the whipped cream is light and fluffy. Start with a layer of brownies (one third of the pan, all chopped up) then spread on top of the brownies one cup of chocolate pudding, then one cup of whipped cream then one cup of chopped up Halloween candy. Repeat all these layers until you end with Halloween candy. You should have one cup of whipped cream left, so use that on the very top. Chop up as many Halloween chocolate bars as you would like to garnish the top. Refrigerate for at least 6 hours. If you like everything very soft, refrigerate overnight. If you like a little bit of "chew" in your trifle, you can prep it a mere three hours ahead.